Six Required Elements for Life: C, N, O, S, H, and P. Well, maybe not P.
According to James Elser, professor at Arizona State University, the one thing he could always count on telling his students was that “Every living thing uses phosphorus to build its DNA.” After Thurday’s announcement by NASA astrobiologist Felisa Wolfe-Simon, he will probably be rewriting his lectures. At a NASA press conference at 1:00 pm, December 2, 2010, Dr. Wolfe-Simon described work by her team to identify organisms that could make interesting elemental substitutions in biomolecules. Specifically the team looked at Mono Lake, located in California, USA in the Eastern Sierra. Mono Lake is representative of an extreme environment because it registers a pH of 10, is three times more salty than sea water, and contains a great deal of arsenic (average = 200µM), a normally toxic element. Dr. Wolfe-Simon and colleagues were specifically looking for organisms that would substitute arsenic for phosphorus in biological macromolecules like DNA, lipids and proteins. They chose arsenic because it shares many physical characteristics with phosphorus, although it does contain additional electrons within lower energy orbitals that make it more reactive than phosphorus. They took a sample of the lake sediment and selected for organisms that could survive on arsenic by culturing in an artificial alkaline medium (pH 9.8) with glucose, vitamins, trace metals but no added phosphate nor any yeast extract or peptone, and 100µM arsenate that was gradually enriched to 5mM (1). The resulting culture was diluted and plated on artificial growth medium with 5mM AsO43–. The isolated colony was reinoculated into the liquid artificial medium and the optimal amount of arsenate for growth was assessed. 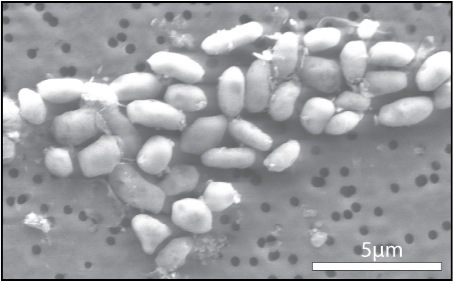 This isolate, named GFAJ-1, is maintained on 40mM AsO43–, 10mM glucose and no phosphate and was identified as a member of the Gram negative Halomonadaceae using 16S rRNA sequences. So this newly dubbed isolate of interest can be grown with only arsenate in its medium. However, GFAJ-1 could also grow in artificial medium with phosphate, no arsenate. The primary physical difference between GFAJ-1 grown with arsenate versus with phosphate is the size of the organism; it is 1.5 times larger when cultured with arsenate and is likely due to the increase vacuole size seen under the microscope. Is this bacterium really using arsenate like it normally uses phosphate? Phosphate is elemental to life for a reason—our proteins, lipids and nucleic acids are built with and use phosphate. The amount of intracellular phosphorus in the cells grown in arsenate medium was measured at 30-fold lower than the same organism in phosphate medium. This deficit indicated that the cells were substituting arsenate for phosphate. The intracellular arsenic in GFAJ-1 grown on arsenate varied, and the authors suggested the postulated instability of the cellular structures using arsenic might be the culprit. The intracellular distribution of arsenate was examined using radioactive 73AsO43– and observing the radioactivity in each cellular fraction. The majority was found in the protein fraction with the caveat that the numerous nonprotein metabolites like ATP and NADH likely overestimate the quantity. However, arsenic was also found in the nucleic acid, lipid and metabolite fractions. The researchers decided to focus on the nucleic acids, specifically the genomic DNA, to further examine the arsenic substitution for phosphorus. Phosphate is an integral part of the backbone of the DNA helix , and so this is where arsenate would be expected in the genomic DNA. Genomic DNA from both arsenate- and phosphate-grown GFAJ-1 was gel purified and the ratio between As:P determined. The analysis found that when the cells were grown in arsenate, arsenic was found in greater amounts than phosphorus and vice versa for phosphate-grown GFAJ-1. X-ray analysis showed arsenic in structures with oxygen and carbon similar to the bond distances measured in the crystal structure of DNA, suggesting that arsenic could be found in the DNA backbone like phosphorus. GFAJ-1 is a unique organism because while it is part of the Halomonadaceae family of Gammaproteobacteria, which have been known accumulate arsenic (2), this is the first living organism to substitute the use of one element, As, for another, P. The analysis performed only suggest its use in biomolecules, but at the NASA news conference, Dr. Wolfe-Simon stated that she and her team have been delving further into the mysteries of this organism and will be submitting another paper February 2011. Stay tuned to this fascinating story! 2. Takeuchi, M., Kawahata, H., Gupta, L.P., Kita, N., Morishita, Y., Ono, Y. and Komai, T. (2007) Arsenic resistance and removal by marine and non-marine bacteria. J. Biotechnol. 127, 434–42. Acknowledgements: Many thanks to Michele Arduengo for her assistance in crafting this post. Sounds like there is now some debate on this story? Cold Fusion all over again? Thanks for the link Michele, I had missed that story on “cold fusion”. Interesting stuff.